Local attraction is the attraction of magnetic needle to a local magnetic field other than earth's magnetic field. It is caused by any iron material in the vicinity of compass station .Example Steel vehicle ,iron pipes , Transmission lines ,iron ore, arrow etc. Under the influence of local magnetic field ,magnetic needle will deviate from magnetic meridian which results in wrong magnetic bearing of Traverse line. To determine local attraction it is mandatory to take fore bearing and back bearing of each traverse line . If difference between Fore Bearing and Back Bearing Exactly differs by 180▪️ then we assume that both the station ,i.e. A and B are Free from Local attraction . In this method L.A. at each station is found out and then required correction is applied to the observed bearings . 2. 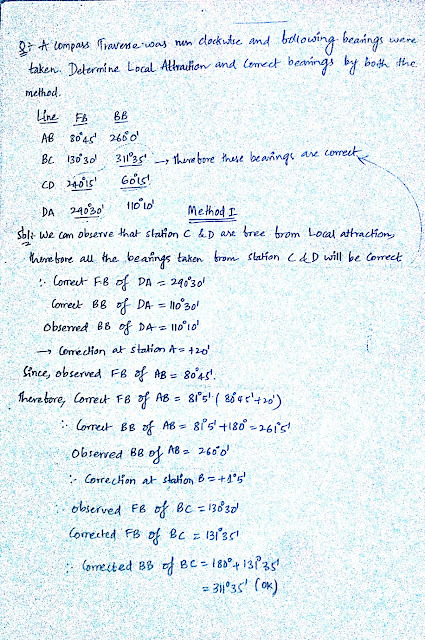 End station of such line are free from L.A. and all the bearings observed from such stations are free from L.A.
3. 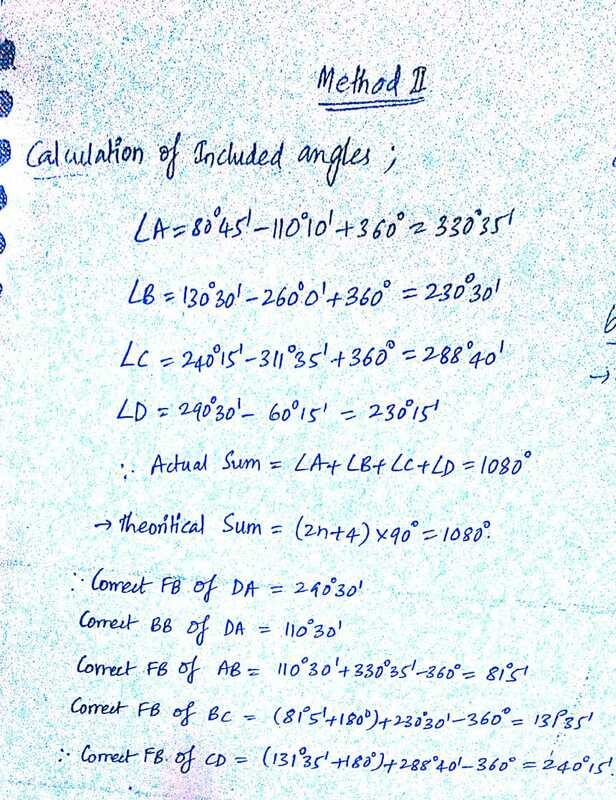 With the help of correct bearing of any line and correction for local attraction correct Fore bearing of next line can be determined . 4. This methods is suitable for open traverse . 5. This method will fail for closed traverse when instrument errors are present ,i.e. theoretical sum is not matching with actual sum . With the help of correct bearing of any line and included angles, we can determine bearing of all the other lines .